Calhoun, who is fleet optimization manager for Altec Industries, took the helm as TMC’s chairman for the next year on March 20 at the reception and banquet at the council’s annual meeting in Atlanta. TMC is a council of American Trucking Associations. 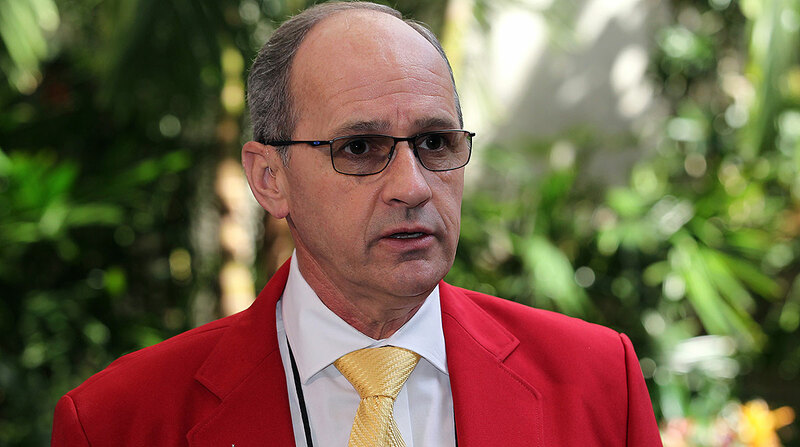 In an interview with Transport Topics a few weeks before TMC’s largest annual gathering, Calhoun, who has been in trucking for about 30 years, said it’s an exciting time for the industry — and for his area of expertise within it. “I am absolutely fascinated with all of the disruptive factors that are coming our way out there now,” he said, referring to the “internet of things,” the electrification of trucks and automated driver-assist systems, which he dubbed one of the “building blocks” of autonomous trucks. “What’s really cool about it is pretty much all of those categories have the ability to feed me data to help me understand how a vehicle is not only performing, but how it’s being operated,” said Calhoun, who previously served as TMC’s vice chairman and chairman of meetings. His employer, Altec, provides equipment and services to the electric utility, telecommunications, tree care and contractor markets. The Birmingham, Ala.-based company operates a range of Classes 5-8 vehicles, as well as a variety of off-highway equipment, said Calhoun, who is based out of Altec’s service center in Conway, Ark. As TMC chairman, Calhoun intends to continue the council’s push to attract more workers to service and repair the nation’s trucking equipment. “Certainly the biggest goal that we have identified” is addressing the technician shortage, he said. Calhoun succeeds Jeff Harris, vice president of maintenance at USA Truck, who concluded his one-year term as TMC chairman at the banquet. Calhoun joined Altec in October 2017. That’s when Altec acquired a company that he had established in 2015, called Roanwood Maintenance Data Management, which provides data analytics for fault-code information received through telematics. “These services take advantage of early warnings provided by a vehicle in order to reduce catastrophic failures, downtime and costly tow charges,” Calhoun said. He started Roanwood when he was vice president of customer relations at TruckCenters of Arkansas, a Freightliner dealership. The owners of TruckCenters didn’t see a conflict, so he had both jobs for a while, he said. During that time, Calhoun spoke at two conferences focused on the electric utility industry. That’s when Altec discovered him. Not long after, Altec representatives asked if he would be interested in selling his company to them and working for them. Roanwood became Altec Maintenance Data Management and now is part of the company’s service group. “We offer the services to external customers in addition to our internal fleets,” Calhoun said. Each morning, Calhoun’s team receives information from various telematics systems on all the fault codes recorded during the previous 24 hours. The data comes from multiple internal and external fleets. From there, they attempt to find trends in that data. “We have our biggest wins when we identify something we can tweak in our scheduled PM services that prevent the failures from occurring at all,” Calhoun said. When asked about any pesky equipment, he said that today, aftertreatment systems are “probably the most problematic” for most fleets. Turning to his key priority as TMC’s chairman, Calhoun said addressing the technician shortage has been “near and dear to my heart” for several years. However, the problem isn’t unique to trucking. “Pretty much every industry you can think of has come to the realization that when it comes to skilled labor, there’s just not any available,” he said. “We simply find that not only the quantity but the quality of what’s being produced out there by the educational system doesn’t necessarily meet our needs,” Calhoun added. He compared the situation to the construction of a pipeline. “Today, we have a number of sections of pipe that are scattered around on the ground but they’re not connected,” Calhoun said, adding that TMC’s latest initiatives are aimed at connecting them. At the council’s fall meeting, for example, TMC established an ad hoc committee focused on technician apprenticeship standards, he said, noting he introduced the motion to establish this committee. With this effort, TMC is tying the nationally accredited Automotive Service Excellence Foundation’s standards to the Industry Recognized Apprenticeship Program that TMC is creating. This joint effort between ASE and TMC, Calhoun said, was born from an executive order issued from the White House in June 2017 — Expanding Apprenticeships in America. ASE’s Inspection Maintenance and Minor Repair task list represents about 540 hours of instruction. An employer also would be able to use this task list as the framework for the apprenticeship’s on-the-job learning component, he said. The IMMR task list “very likely mirrors” an employer’s scheduled PM inspection forms. Calhoun said entry-level technicians have plenty of opportunities to advance once they enter this industry. Calhoun keeps busy on related industry initiatives. Among them: He serves on the board of directors for Associated Industries of Arkansas, which is the parent organization of “Be Pro Be Proud.” This initiative takes the message about technical careers to junior high and high school students, he said. He also was wrapping up a two-year term on the Arkansas General Assembly’s Legislative Task Force on Workforce Education Excellence. And earlier this year, Calhoun started a two-year term on the research advisory committee of the American Transportation Research Institute. Calhoun first began his career in trucking in about 1989 at Harold Ives Trucking Co., an over-the-road truck fleet based in North Little Rock, Ark., with about 500 tractors and 1,000 trailers. “I worked behind the parts counter dispensing parts to technicians who were repairing trucks,” he reflected. Calhoun moved up through the ranks, including as a shop foreman for a couple of years. He was always familiar with the trucking business, he said, noting that his brother owned a small trucking company in southern California that moved mobile homes.